No matter how near or far you are from home, a recommendation for a good restaurant or bar is always nice to have. EATS is a collection of places that I’ve enjoyed during my travels. I found Ober Mama by accident and am glad I did. Very glad. First by its kitschy name and proximity to the trendy Marias neighborhood. 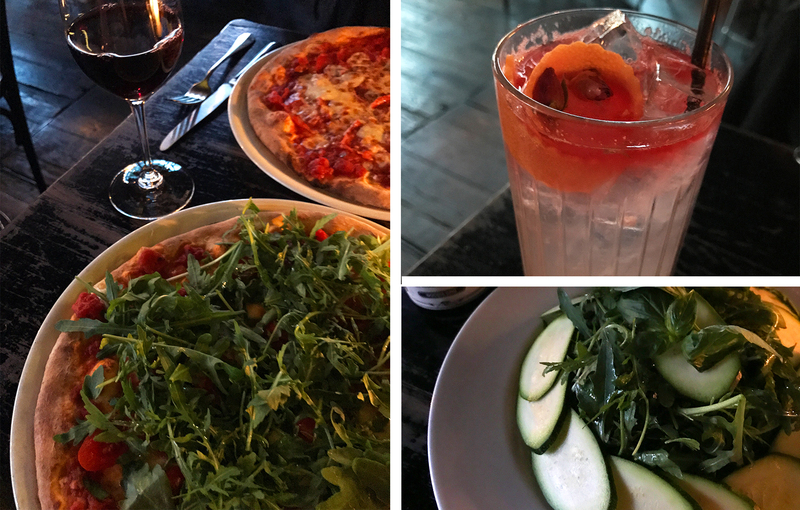 Then by the stunning photos and reviews online and finally by its oh-so-amazing menu of fresh seasonal pastas, Neapolitan-style pizza and clever cocktails, including make your own Negroni. Sold. I’m clearly not the only one who experienced this love-at-first-sight feeling, as I read rumors about a line wrapping around the block as opening time approaches each night (the restaurant does not take reservations – first come, first seated). We arrived about 15-20 minutes early and joined the crowd of hungry people vying to snag a table. At 7pm on the dot the waitstaff threw open the doors with a big, boisterous “Buona sera!” And somehow after all of the build-up, luck smiled upon us and we were seated by 7:15pm. 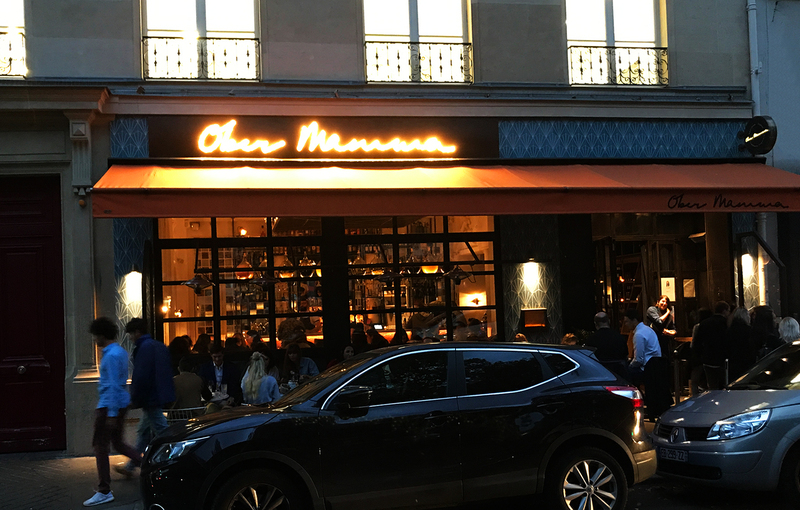 Ober Mamma’s interior is eclectic chic, with a gorgeous marble and copper bar offset by big antique mirrors, mismatched furnishings, painted ceramic plates. After ordering cocktails we set out to tackle the food menu (which proudly boasts that everything is homemade with products sourced directly from Italy), starting with a burrata caprese salad consisting of tomatoes in a variety of shapes, sizes and colors topped with ooey, gooey cheese, pine nuts and a drizzle of pesto. We followed this with a Margherita pizza (the only true way to judge the quality of a restaurant’s pizza) and Ober Mamma’s “famous” truffle pasta. Needless to say, the food was sublime (no room for dessert, although we wish we had after watching tiramisu be served from a casserole dish by the scoopful to the table next to us), the service was laid back and the overall experience is definitely worth the wait. 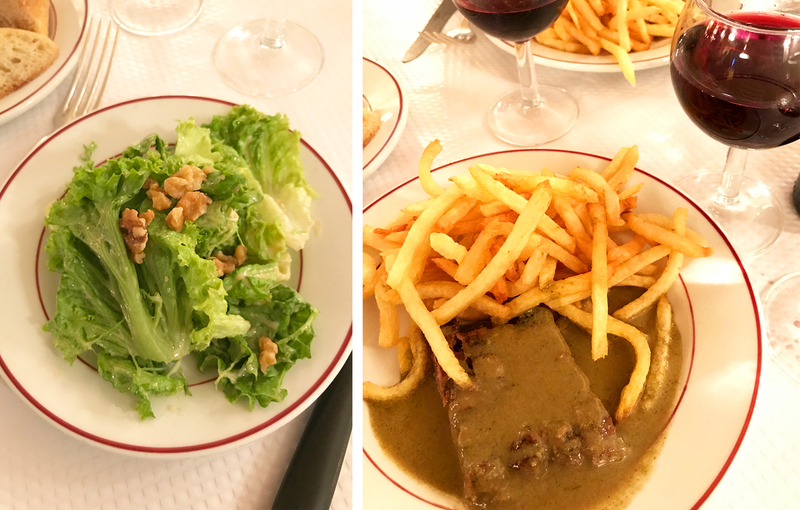 One of the most common dishes at brasseries throughout Paris is steak frites – literally steak and fries – and at Le Relais de l’Entrecôte it’s the only thing that’s served. Seriously, there’s no menu until you get to dessert, but let’s not jump ahead. This family-run institution dates back to 1959 (now with multiple arms and locations around Paris and the world) and since then very little has changed, right down to the black and white uniforms worn by the waitresses. 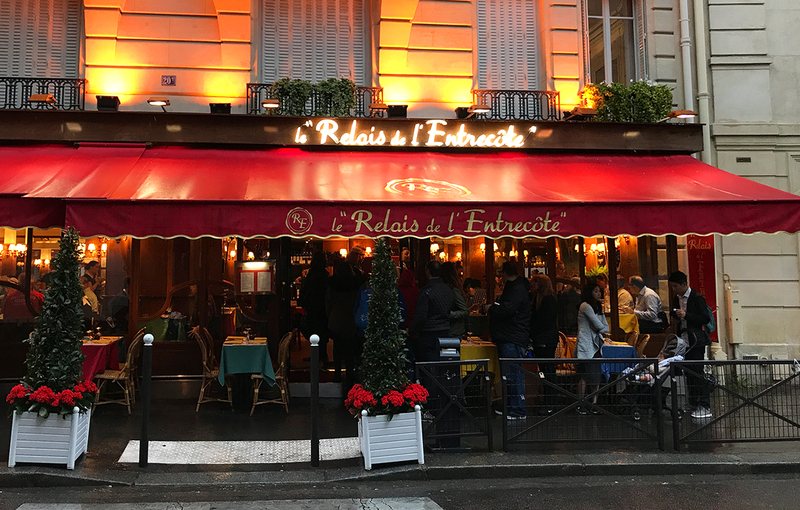 Le Relais de l’Entrecôte is another place I would advise you to arrive early to get a spot in the line that’s sure to stretch down the block (we dined at the Saint-Germain location and still had to wait despite the pouring rain). After being seated the waitress took our drink order (we opted for a house red wine) and ask only one other question – how we wanted our steak cooked – noting our preference with a flick of her pen on the paper table cloth. The meal began with a simple salad tossed with walnuts and a mustard-based vinaigrette. Then no sooner had we finished the starter, one of the women in black emerged from the kitchen with a big platter of thin-cut fries and sliced steak topped with a butter-based “secret sauce” (we overheard the table next to us say the recipe is so secret that it’s not even made on the premises). Working from warming stations strategically placed around the restaurant, we watched in awe as the waitresses moved from table to table serving hearty portions of what I would characterize as “all you should eat” steak and fries (tip: go hungry). And once a person manages to clean their plate – this is where things get even more interesting – the waitresses magically reappear like clockwork to refill it with a second and equally as hearty serving of both (another tip: if you don’t want more you can always pass, or graze on your fries and only have a second serving of steak). Feeling like we’ve eaten for two, the waitresses materialized once more to tempt us with one (or more) of the many dessert options presented in large colorful pictures on a menu (third tip: which should be the first, save room for dessert). We ordered a pistachio cream cake that was not shown on the menu but was in the display case next to our table, which was was nothing short of sublime, and a chocolate cake with ice cream and whipped cream. At this point a long walk along the Seine was in order, but our experience at Le Relais de l’Entrecôte was definitely a fun and memorable one. I don’t remember how I first stumbled upon Grazie but I do know that it’s been on my list for the better part of 5 years despite multiple visits to Paris during that period. 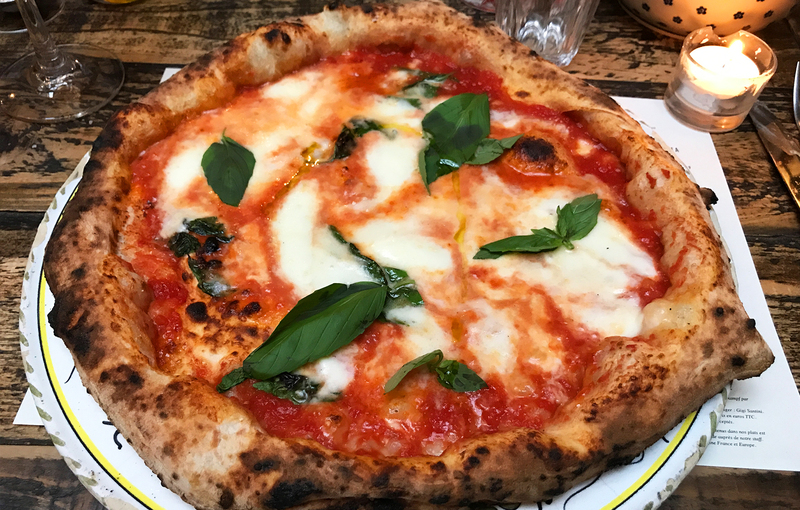 Every time we’ve tried to eat at this hip pizza place on the fringe of the Marais neighborhood, reservations were either already booked up or the waiting list was considerably too long. A good indication of the restaurant’s popularity? One would hope. With this past history in mind, we made it a point to get a table during our last trip to Paris, diligently making our reservation a few weeks in advance for a weeknight around 7:30pm. There were already several tables seated when we arrived and the remainder of the restaurant filled up quickly. If you don’t know what you’re looking for it’s easy to walk right by Grazie thanks to its dark and discrete exterior with big windows and punches of bulb lights that bears no name or signage. The interior is also dim with a laid back vibe reminiscent of a favorite neighborhood dive bar. Its menu offers a handful of creative seasonal cocktails, antipasti and wood oven pizzas made from Italian-sourced ingredients. Following cocktails, we ordered a carafe of red wine (brought to us in a laboratory beaker) along with a zucchini and arugula salad. For pizza we opted for the spicy sausage-topped Babbini and the Crudaiola with cherry tomatoes and more arugula (so much arugula!). The pizzas were delicious and definitely hit the spot but I have to admit that they were eclipsed by others that we had during the same trip. Street food is often some of my favorite food when traveling, and L’As du Falafel (the Falafel Ace) was no exception. This Kosher Middle Eastern restaurant is located in Paris’ Jewish Quarter in the heart of the Marias that dates back to 1979. If you happen to miss the green storefront, the long line stretching down the block is a dead giveaway that you’ve come to the right place. While L’As du Falafel offers both dine-in and walk-up service, we decided to join the masses and order our food to take away. Over the years, a handful of other competing businesses have popped up in the area, each claiming to have the best falafel in town. 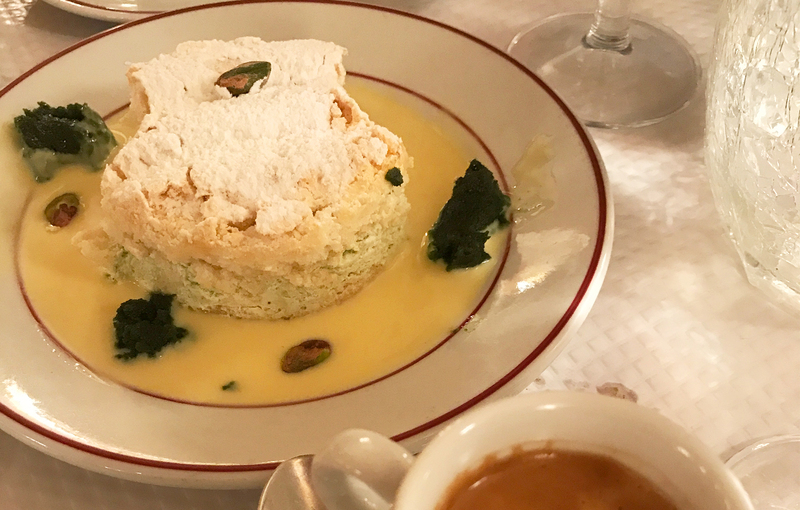 Not for the faint-hearted, you must keep your eye on the prize you make your way past the restaurants promoters that line Rue des Rosiers, husting to attract hungry passerbyers to their establishment. It’s an experience that reminded me of my childhood visits to Little Italy in New York where each restaurant had its own “guy” outside pushing a 3-course lunch special. The line at L’As du Falafel moves along efficiently as one of the aforementioned guys comes by to take your order and payment while you wait, so all you need to do is hand over the ticket with your selection when you reach the window (tip: look at the posted menu and know what you want before getting in line). 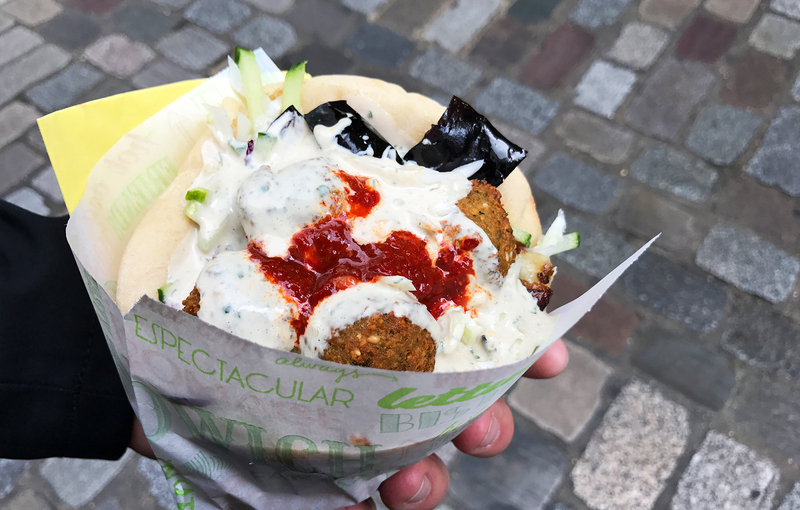 Although the menu has a variety of different falafel, schawarma and other dishes, we went with the standard falafel special – crispy fried chickpea balls, lettuce, tomatoes, cucumber and roasted eggplant topped with a spicy sauce and creamy tzatziki stuffed in a fluffy oversized pita pocket. We barely made it a few steps away from the window, leaning against a building on the street to indulge in this beyond amazing creation. Looking around, we weren’t the only ones who couldn’t resist as other people were doing the same. Grab a fork and lots of napkins, you’ll need them. After our falafel something sweet was in order, which led us to Glace Bachir. 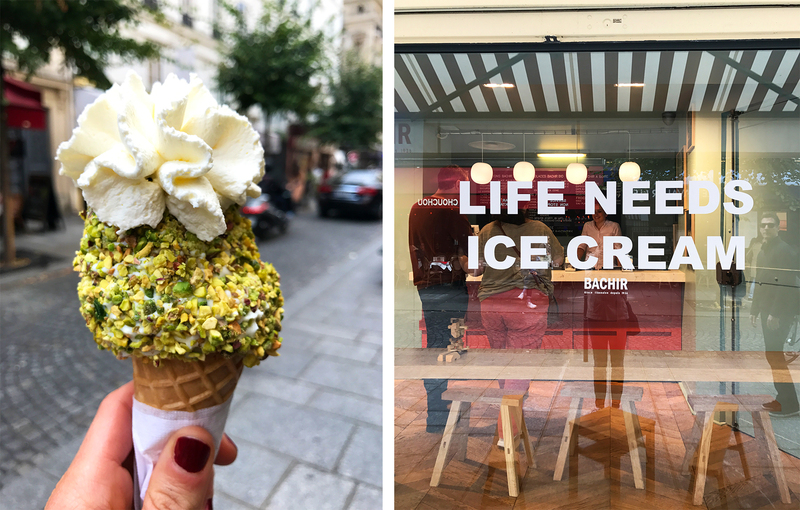 This Lebanese ice cream shop is the first of its kind in Paris located a stone’s throw from the Pompidou Center. While the family-run business dates back to 1936, the Paris location only recently opened in January 2017 as the first shop outside of Lebanon. I was first seduced by photos of its towering pastel-colored ice cream on Instagram and couldn’t wait to try it for myself. What makes Glace Bachir unique is its simplicity and focused selection of 100% organic flavors – rose, strawberry, mango, lemon, vanilla, pistachio, almond, milk and dark chocolate and coffee – from which you can choose as many as you like in one of 3 different sizes of cups or cones. 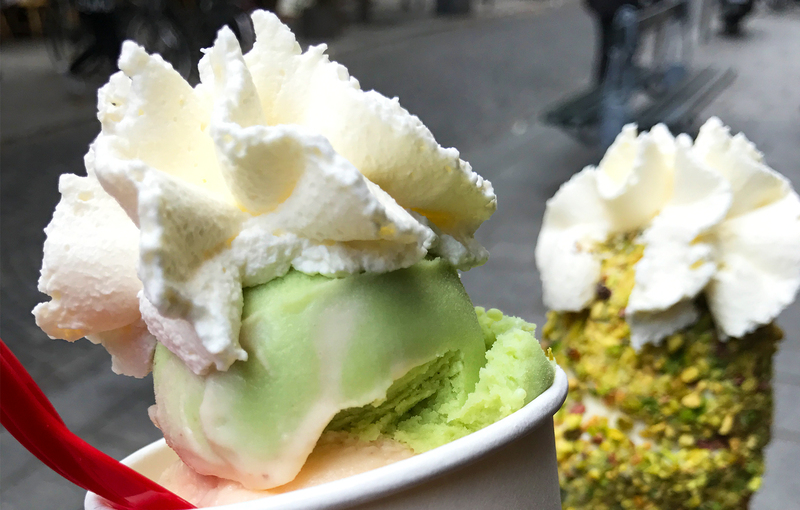 That and the specialty glace achta (pronounced with a “sh” sound), a milk-based ice cream with hints of orange blossom and pine-flavored mastic, which is then rolled in chopped pistachios and topped with homemade whipped cream. While the achta is what we came for, we also couldn’t resist trying a few other flavors and ordered a cup with a scoop each of almond, pistachio, dark chocolate and rose. We sat on the wooden benches outside under the shop’s awning while we enjoyed our frozen treats, a brief haven from the drizzly Paris afternoon. I highly suggest you seek out Glace Bachir as it was such an enjoyable and unexpected experience that can be summed up with one word: sublime. While on the subject of sweets, there is no shortage of tempting treats in Paris and another to add to the list is chocolate mousse at Chapon. Founded by Patrice Chapon, who stakes his clam as the only full-time chocolatier in France to roast his own cocoa beans to produce his chocolate (a process he calls “bean to bar”), the shop elicits that kid-in-a-candy-store-like feeling that everyone can relate to. Among all of the beautifully displayed confections is the bar a mousses aux chocolats, featuring 5 different types of chocolate mousse made from single-origin cocoa beans. Much like an ice cream shop, you can ask to sample a flavor or two before making your selection, which is served in a paper cone (or larger containers to take home) with a rolled wafer cookie and the option of a handful of simple toppings. 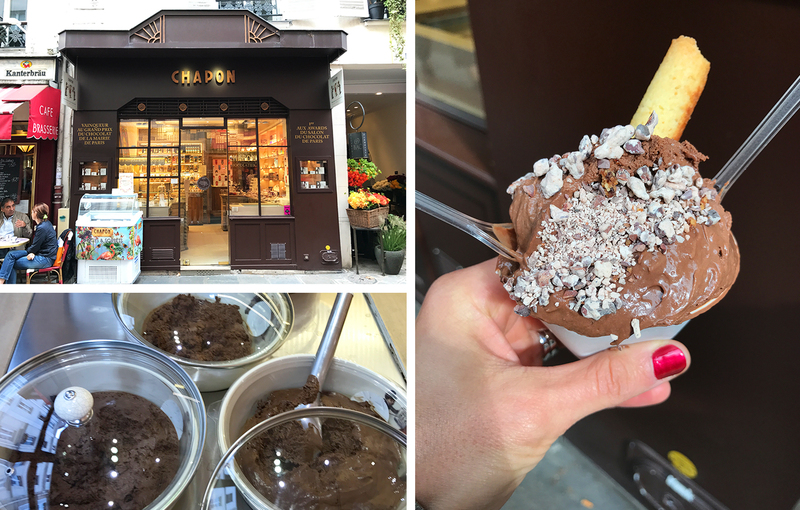 We indulged at Chapon on Rue de Bac in the 7th arrondissement, however the shop has several other locations around the city to get your sweets fix. One more pizza place to add to the list, Mokus l’Écureuil is a good standby option near the Trocadero. It’s not necessarily a place I would have found on my own, rather we were meeting some local friends for dinner who suggested this restaurant. The interior has an edgy feel thanks to red-hued neon lights, cow hide booths and exposed brick and metal details. 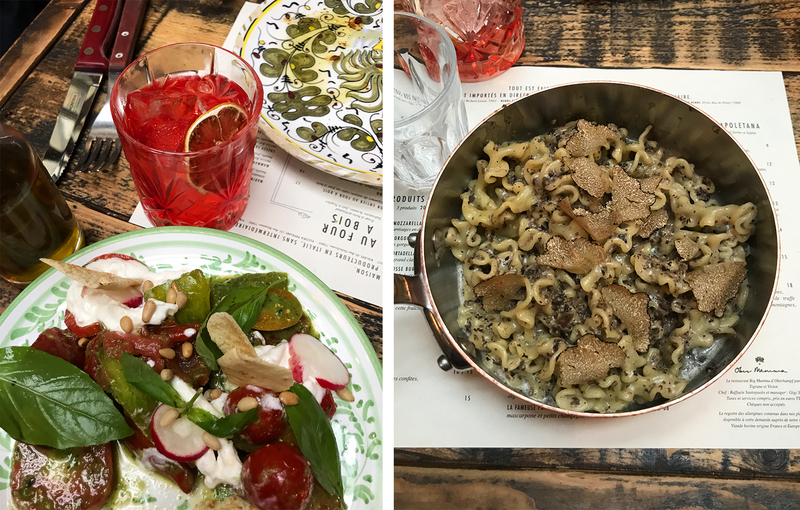 The service was laid back and friendly and the menu has a broad range of offerings including pasta and hamburgers with a focus on its pizze rosse and pizze bianche, along with beer, wine and a full bar of spirits. We ordered several different pizzas, noteworthy because of their perfectly chewy crusts. 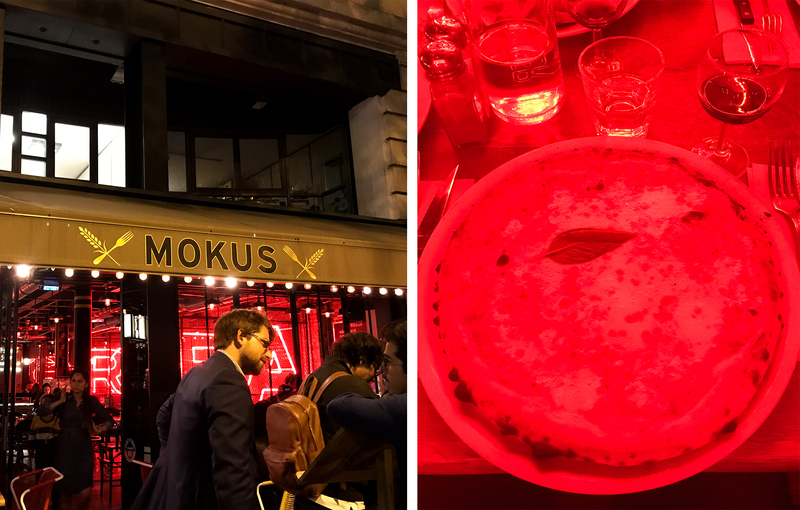 Leaving no room for dessert, we soon discovered another selling point of Mokus l’Écureuil – its convenient location for a post-dinner walk around the Champs de Mars and Eiffel Tower. 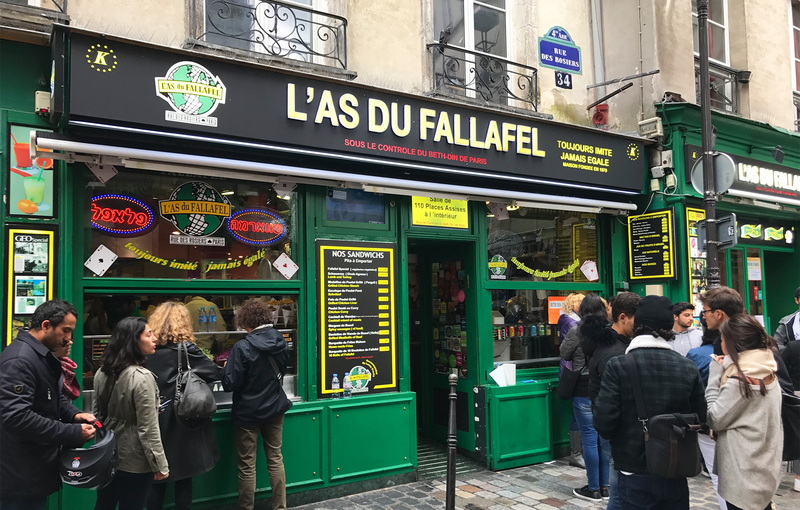 So if you find yourself sightseeing in this in this area of Paris and are looking for a reliable lunch or dinner spot, then look no further. For more Paris EATS click here. Any favorite places in Paris that you recommend? If so, share them below! Yes! Keep it on your list, it was so delicious and Ober Mamma was seriously one of the best meals I’ve ever had. Both were worth the wait! Yum! You’re making me hungry for food and travel! Both are always a good idea!! !